Jonatan Gil continues to play with styles with this interpretation of the Grand Dôme DT. Recognisable at a glance with its tonneau case and the vertical arrangement of the different functions on the dial, the chronograph adopts an elegantly vintage design. The harmonious curves of the imposing 37 x 52 mm case are unchanged, matched with the Valjoux 7751 calibre to power date, day, month and moon phases. 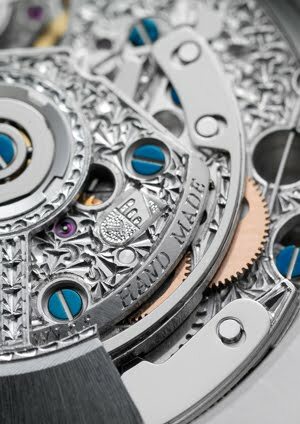 The movement is now delicately hand-engraved and embellished with the coat of arms from the Swiss village Les Ponts-de-Martel, where the brand originates. 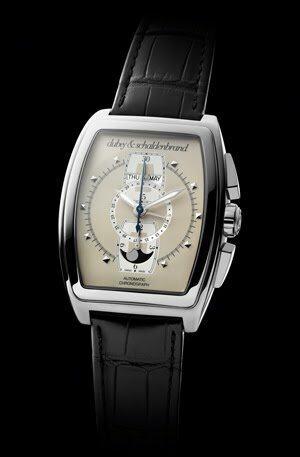 The dial is an expanse of ivory colour for purity and discretion. Contrasting textures and volumes have given way to an elegant interlacing of circles and tonneau-shaped counters. A journey back to historic and aesthetic origins for this 65-piece limited series.